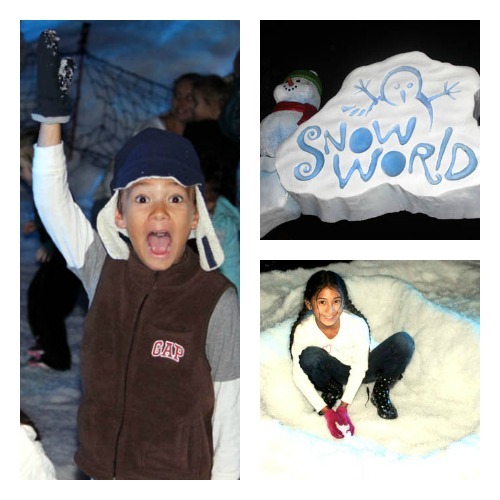 Nowadays SeaWorld® provides the sleds, and places SnowWorld across from Pets Theatre, in an area normally reserved for school groups, and special events. Although it’s very different than the massive hill I knew as a child, it’s still super fun for the littles. 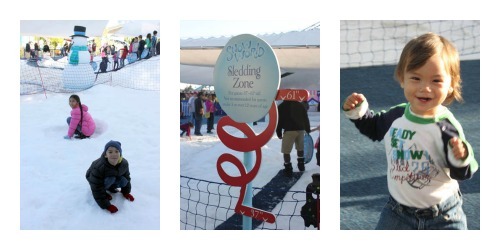 Our kids spend hours there playing in the snow and sledding every time we visit. I don’t go to the extent that my mom would, and dress my kids in a heavy ski jacket, but I do dress them in long sleeve shirts and pants, and bring a warm jacket, and bring mittens. They usually wear jeans, and I always bring a change of clothes because I expect that they may very well need them after hours of snow fun. 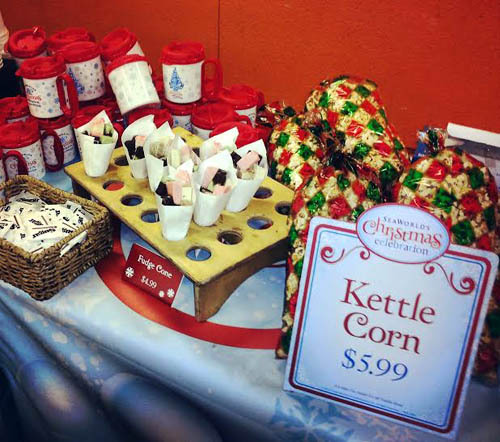 Inside SnowWorld you’ll also find a super convenient concession stand, selling gourmet goodies including fudge, many different types of macaroni and cheese, hot chocolate, cookies, fountain drinks, kettle corn, snow cones, and more. We were invited to a media event at SeaWorld®, and had the opportunity to sample some of the delicious fare. Having a sweet tooth, my personal favorite is the fudge. The different flavors of mac n’ cheese are super yummy, and nothing like you would get out of a box. Aside from SnowWorld, SeaWorld® also has a fun little village with two reindeer visiting from a rescue organization. 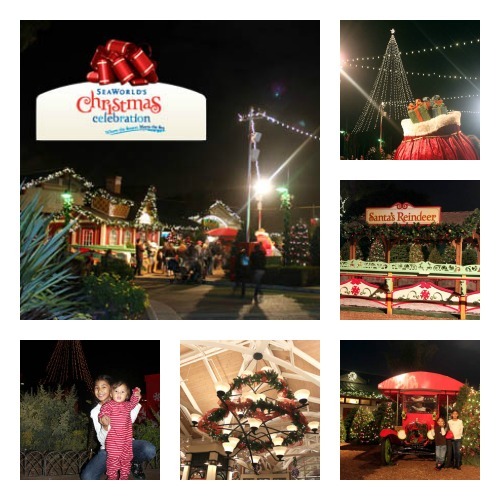 Within the winter village you’ll also find lots of opportunities for festive pictures, including a sleigh, gorgeous Christmas trees, and Santa inside his cottage. Christmas music is played overhead, and the Park is decked out with holiday decor. 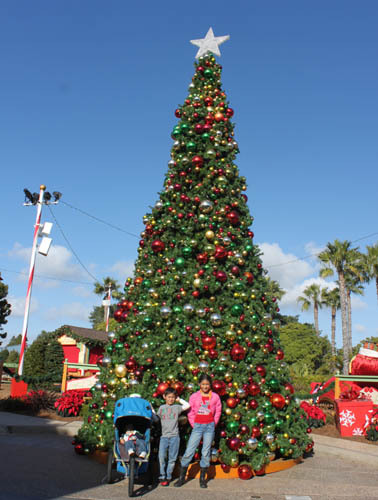 Other festive fun at Christmastime at SeaWorld® include special holiday themed shows, such as Clyde and Seamore’s Christmas Special, Shamu’s Christmas Miracles, Pets Rule Christmas, Breakfast with Shamu and Santa, character greetings, and more. If you visit at night, you’ll be amazed by the amount of twinkling lights. There are more than a million throughout the Park. A fun Christmas tree, close to the entry and exit, flickers between many different shades of vibrant color. 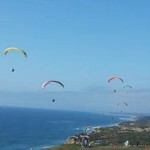 It’s fun to sit and watch. 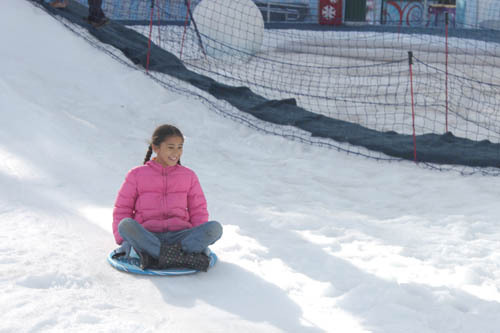 SnowWorld is recommended for kids age 5-12, and has a minimum height requirement of 37″, and maximum of 61″. SnowWorld. 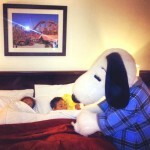 The special seasonal shows and certain seasonal activities run on specific dates. Be sure to check the official SeaWorld website, HERE for the breakdown of events. 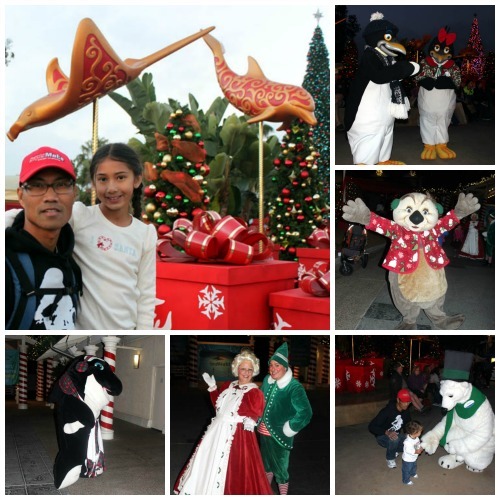 SeaWorld’s Christmas Celebration® is included with the price of admission, or with a SeaWorld® San Diego pass. Perhaps we’ll see you there! Disclosure: We were invited to attend a media event that fell on the same day as the Member Preview Day for Christmas at SeaWorld®. As members, we attend the Member Preview each year. Our opinions are our own.